Successfully implementing a service-oriented architecture (SOA) requires applications and infrastructure that can support the SOA principles. Applications can be enabled by creating service interfaces to existing or new functions hosted by the applications. The service interfaces should be accessed using an infrastructure that can route and transport service requests to the correct service provider. As organizations expose more and more functions as services, it is vitally important that this infrastructure supports the management of SOA on an enterprise scale. 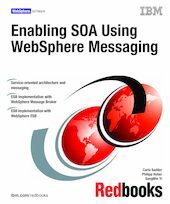 This IBM Redbooks publication looks at how IBM messaging products support an SOA environment. In particular, it looks at WebSphere Application Server, WebSphere Enterprise Service Bus, WebSphere MQ, and WebSphere Message Broker in an SOA environment. We discuss how they support SOA, compare the potential ESB product implementations, and show examples of building the infrastructure and creating mediations.